The main image of this article shows Tom Cruise (wearing a customized U.S. Navy HGU-68/P flight helmet) after he had to halt filming on Top Gun: Maverick because of a mid-air “flap caution” forced an unscheduled landing. The 56-year-old action star has been shooting Top Gun Sequel this month, but had to cut Monday’s shoot short after mid-air flight issues. As reported by TMZ, Cruise flew in an F/A-18 with a Hornet driver from an airbase in northern California. The U.S. Naval Aviator acts as the actor’s double, while Cruise sits at the back of aircraft with cameras facing his point of view. 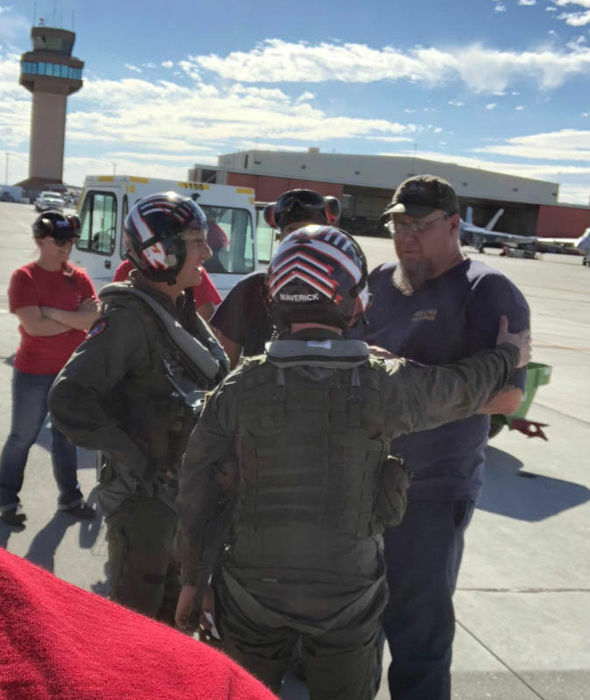 According to Express the two were snapped at an airbase in Nevada, having had to make an unscheduled landing after the jet saw a “flap caution” mid-air. However Maverick and his pilot soon flew back to California in another plane though. Noteworthy as we have recently reported Maverick’s ride for Top Gun sequel will be a cool special painted F/A-18F Super Hornet.